La città di Venezia ospiterà nei giorni 26, 27 e 28 settembre il Simposio ONU "Toponymy and Cartography between History and Geography" organizzato congiuntamente dalla Regione del Veneto, l'Istituto Geografico Militare e l'Istituto Veneto di Scienze, Lettere e Arti. Locandina Apertura Simposio (4.5 MB). L'evento proseguirà nei due giorni successivi presso la Sala delle Adunanze di Palazzo Loredan, sito in Campo Santo Stefano e nelle disponibilità dell'Istituto Veneto per le Lettere Scienze ed Arti. La partecipazione al simposio, che si terrà all'Istituto Veneto di Scienze, Lettere ed Arti, è solo su invito. Presidents of the Italian Scientific Associations of Cartography and Geography. The standardization of geographical names in Italy and the joint project IGMI - Veneto Region. Presentation of the project "The Italian Geographic Military Institute and the Veneto Region for a new geographical names database". Campo Santo Stefano, 2945 - Venezia. "Toponymy and Cartography between History and Geography"
Modern maps, Geographic Information Systems and toponymy in Cyprus. State of the art on the standardization of geographical names in Brazil. The significance of native experience in the creation of colonial toponymy in the Portuguese America. International Geographical Union - International Cartographic Association. Where are you flying? On-board airline magazines and their route map toponymy. Preservation vs. innovation in the toponymy of Europe. Territorial Identity and Place Names. Toponymy and colonization, the case of Italian colonial villages in Libya. Urban Toponymy in Shanghai and Tianjin before the Rise of the People's Republic of China. The Presence of Italian Road Names. 14:00' Memory picture of the symposium participants in Campo Santo Stefano. Dialectical terms and geographical locations. 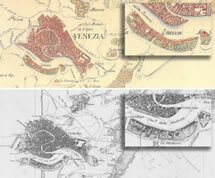 Vernacular places names in the Venetian cartography (XVII-XVIII century): a case study. The transformations of the place names of Naples in historical and contemporary cartography, between landscape changes and territorial identity. The precise toponymy of descriptive cadastre (before XVIII Century). Geo-cartographic aspects of the toponymy of Sardinia between conservation and enhancement. Place names as sources to identify landslides risk areas: a diachronic approach to the Trentino case study. Toponymy, History and Geographical System of Selected Place Names in the Cognomen of the Alaafin of Oyo. A gazetteer in the 2nd century: Claudius Ptolemy's Geographia. The greek ethnonym Romanoi in the Administrando Imperio of Constantine Porphyrogenitus. 19th Century cadastres as a source for the toponymy of the Venetian region. The cadastral particle toponymy of the Grand Duchy of Tuscany. Place names as historical products: boundary conflicts and toponyms disputes in XVIII c. Liguria. Phitonyms, phitotoponyms and landscape's history. The case of the municipalities of Borgo San Lorenzo and Vicchio. Andrea Cantile, Chairman of the UNGEGN-RHD. Peter Jordan, Österreichische Akademie der Wissenschaften, Institut für Stadt- und Regionalforschung (Österreich).